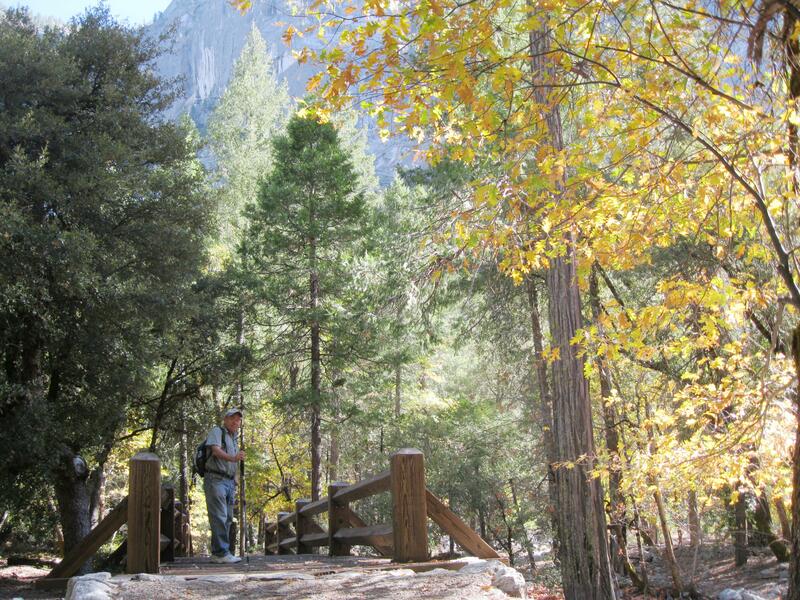 Today I hiked a portion of the Snow Creek Trail in Yosemite National Park with my friends Mary Elizabeth and Paul. 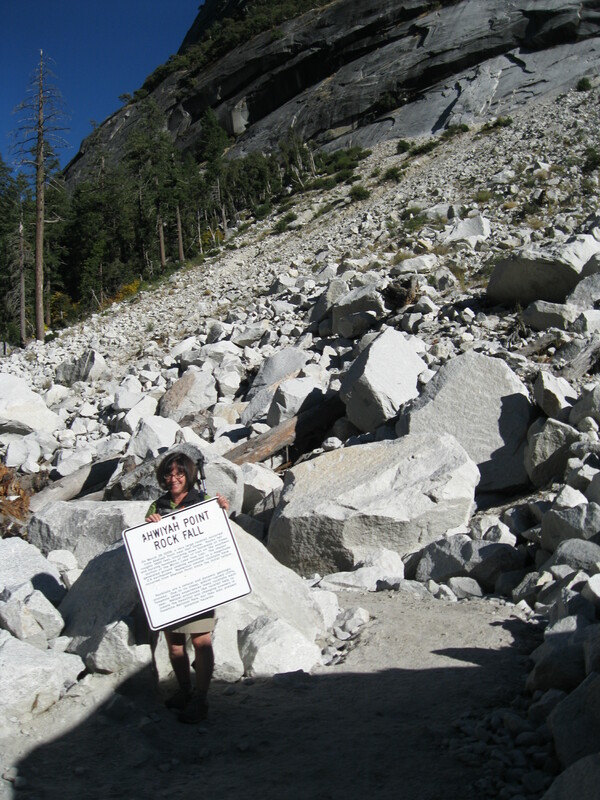 There was a two-mile walk to reach the Snow Creek trail from the Mirror Lake trailhead. 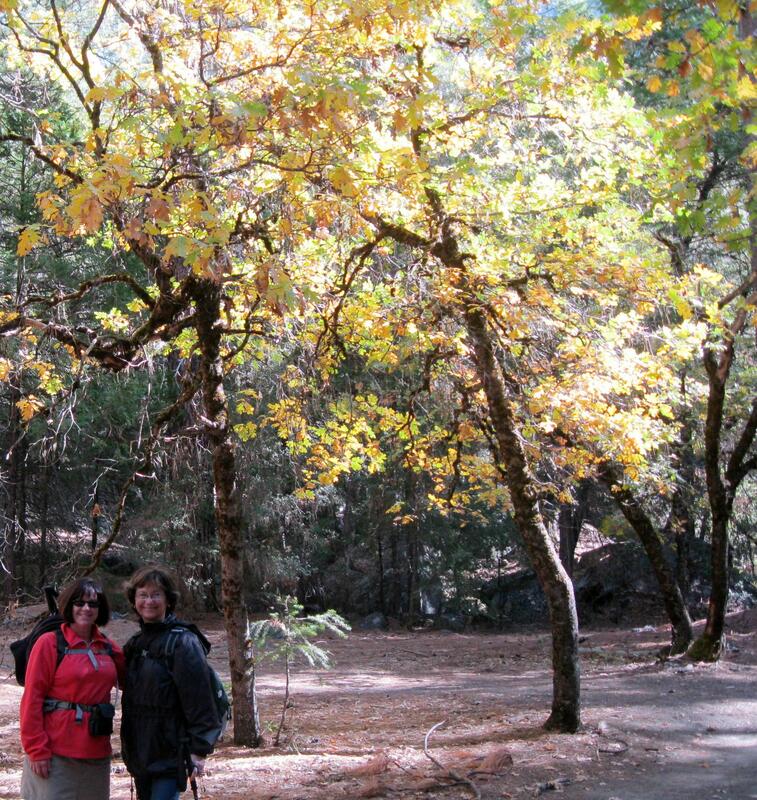 Janet and Mary on the trail to the trail. At first we walked the same wooded path that Chris and I took a couple of weeks ago. The vibrant yellow leaves that once brightened the trees were beginning to turn brown. 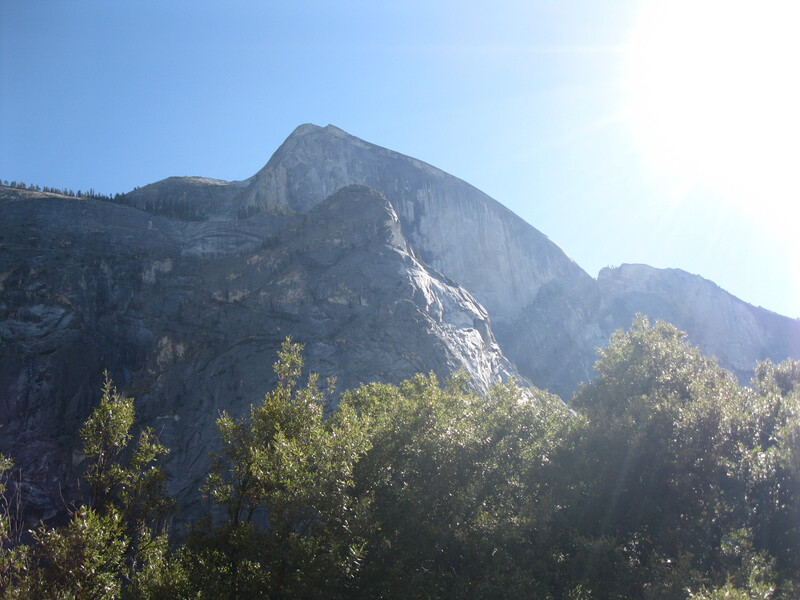 We walked in the shade of Half Dome on the rocky pack trail while dodging plump road apples. Looking up at Half Dome after the sun rose high in the sky. 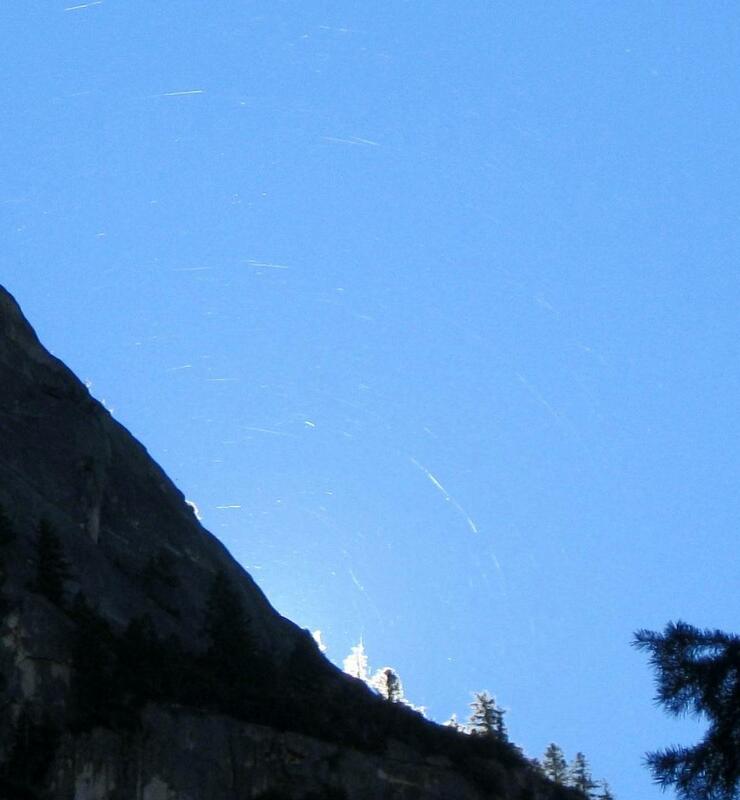 As the sun began to rise above the mountain, we looked toward Half Dome and saw gigantic spider webs glistening in the sun. The enormous snares stretched in a semicircle from one end of the mountain to the other. I did what I could to photograph this extraordinary find with my little point-and-click camera. The white streaks are spider webs. The granite mountains and the unusual spider web weren’t the only big things we saw while exploring. As a breeze blew through the fall foliage, leaves fell to the ground like rain. 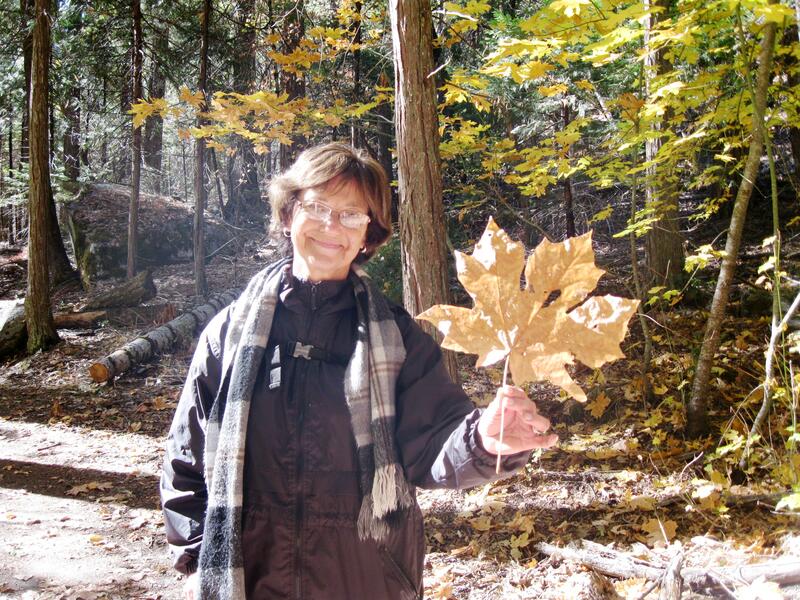 Mary found a giant maple leaf. The maple trees don’t get big in Yosemite, but the leaves do. We reached the Snow Creek trail announced by a large metal sign, “Trail Rules”, attached to a boulder at the trailhead. From there we began the steep, heart-pounding climb. Who brings a cat on a trail? As the 3.4 mile trail escalated around switchbacks and we left the shade of the trees, we felt the heat from the sun radiating off of the granite walls. 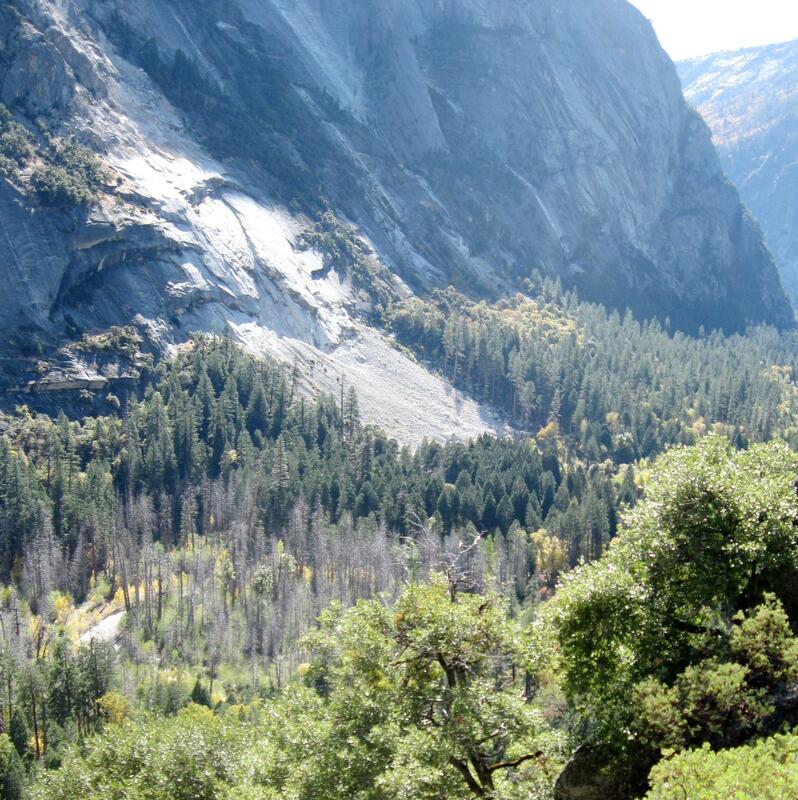 We looked down upon the blanket of trees in Tenaya Canyon; and across at Half Dome, Clouds Rest and Mt. Watkins. Snow Creek, the trail’s namesake, was somewhere but without a drop of water in sight, we had no clue where. The trail inclined 2,300 feet, but we were not going to the top. We turned back and carefully stepped down the slippery slope and made our way back to the Mirror Lake Loop. We sat for lunch near the bridge that spanned a waterless section of Tenaya Creek. Paul on the bridge over Tenaya Creek. 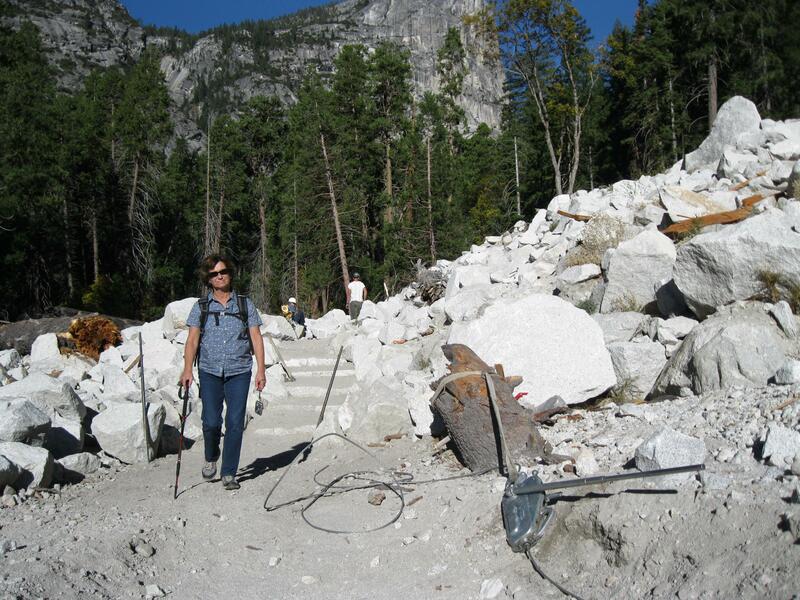 Continuing on the loop trail, we walked through the construction site at the Ahwiyah Point rock fall. 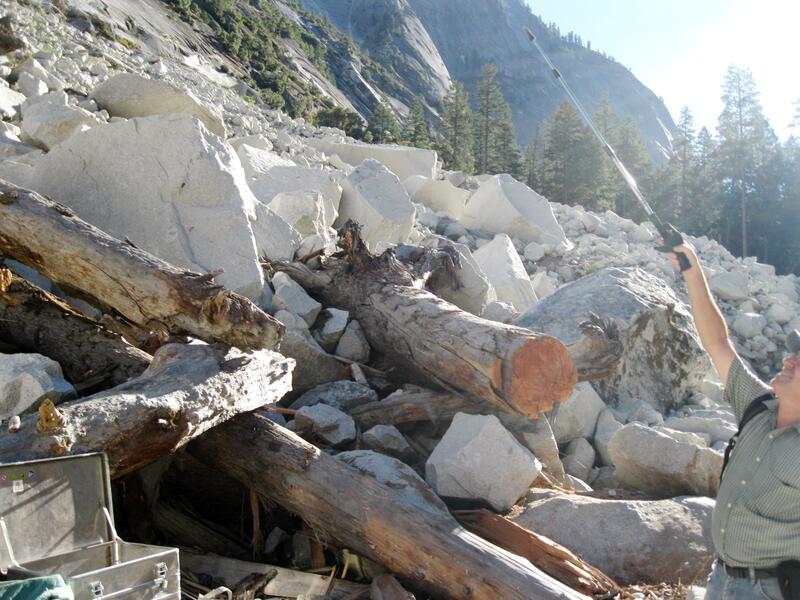 A crew was working diligently at repairing the rock-strewn trail. Mary Elizabeth walking through the construction site. Paul, pointing at Ahwiyah Point with his walking stick. 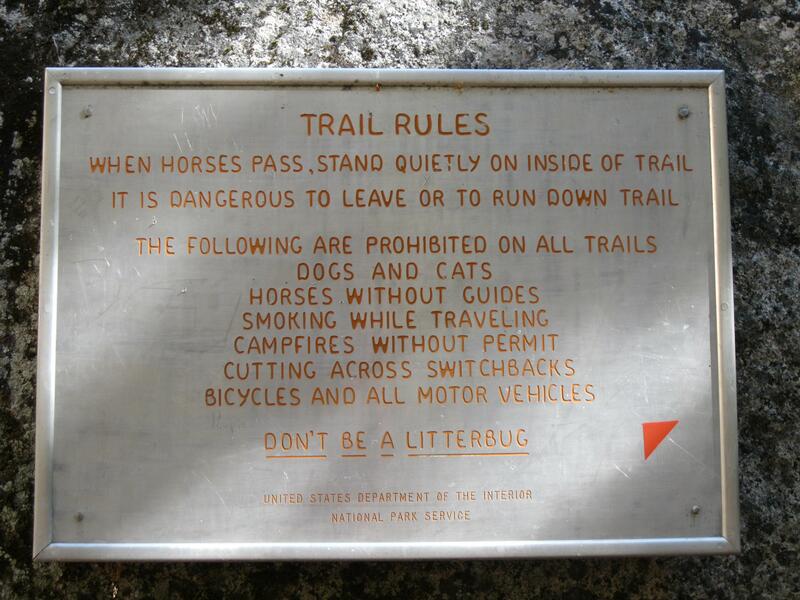 A sign originally posted at the trailhead when it was closed, now leans against the rocks. Looking up at Ahwiyah Point, we saw where the granite had slipped away decimating the forest below and depositing 115,000 tons of white talus on the slope near Tenaya Creek. Looking at the rock fall from the Snow Creek trail. You can see where the forest was obliterated. We finished the five-mile loop in the late afternoon but still had a long walk back to the car. It was quite a walk, and was a another fun day spent with friends in this awesome area. 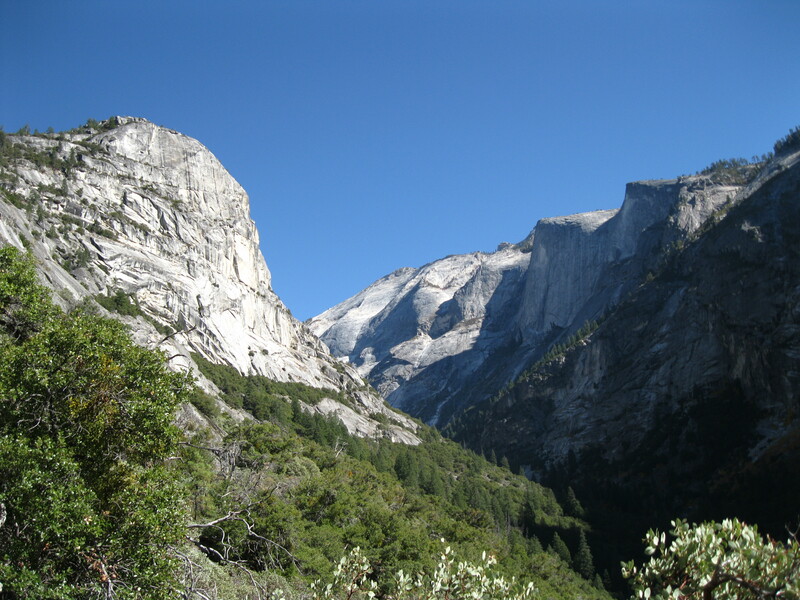 Another angle of Half Dome (background) from the trail. Ahwiyah Point in the foreground. 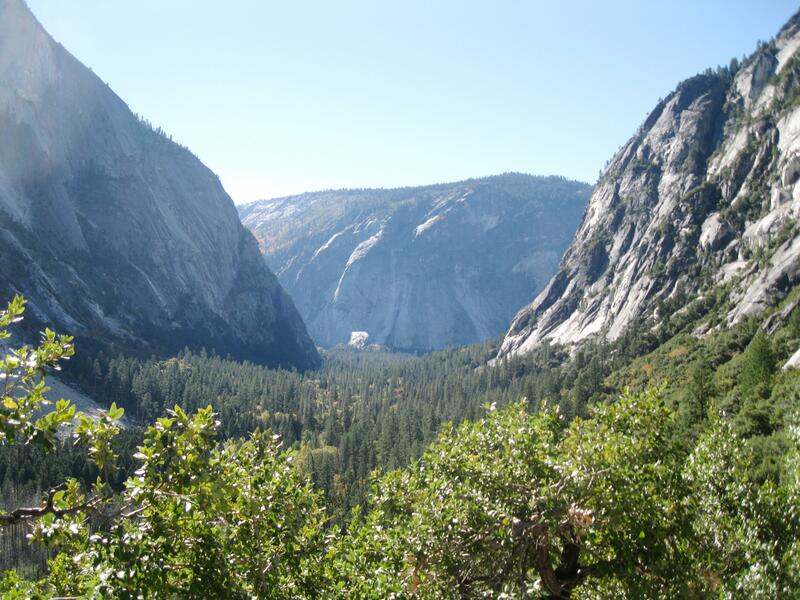 This entry was posted in Yosemite Hikes and tagged Ahwiyah Point Rock Fall, Hiking, Mirror Lake Trail, Snow Creek Trail, Yosemite on November 10, 2012 by Janet. 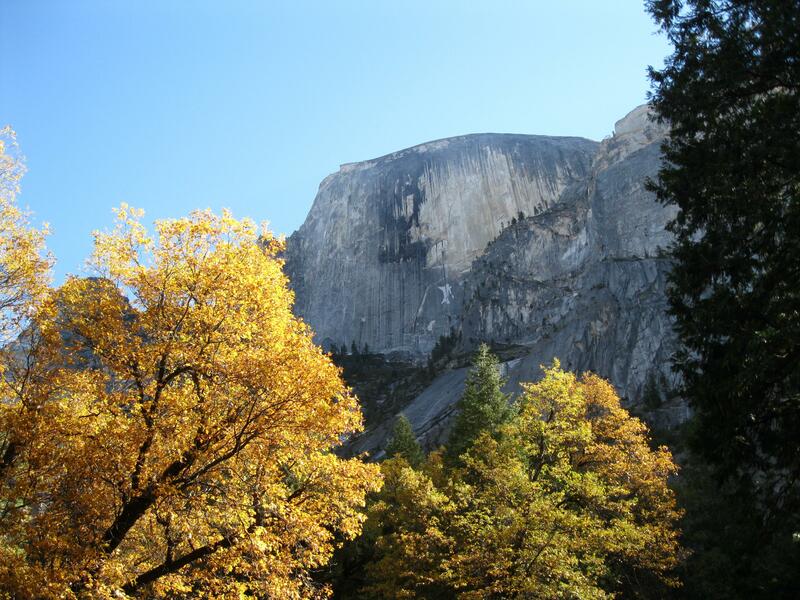 MAJOR “WOW” I am printing out your WONDERFUL photo of Half-dome. I am taking a water-color class. Going to see if “somebody” (maybe me) can paint it! OUTSTANDING PHOTOS! More great pictures and narrative. That spider web was HUGE! When I clicked on the picture I was able to zoom in much closer and could see a lot of detail. Welcome back to M.E. I’m glad you have your hiking partner back. PS: I enjoyed our lunch at the Ahwahnee. The food and Manhattans were good, but spending time with my daughter was GREAT! Great pictures, really love that one with the web…so cool! Thanks, Kathy. The web was VERY cool to see. As the sun came it, it disappeared from our sight. Okay I had to laugh at the very thorough trail head sign. That is a new one for me. I especially like smoking while traveling! BTW: Just love your Dad’s comments. I should have taken a photo of the boulder too to show the actual size of the sign. 🙂 My dad and I had a nice lunch the next afternoon.